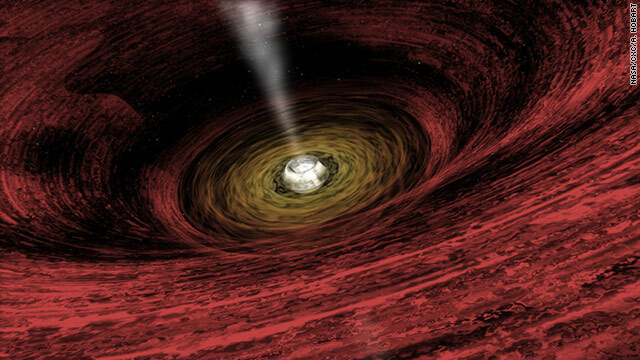 A supermassive black hole, with a disc of gas rotating around the central object, is shown in this artist's impression. (CNN) -- Black holes may be featured in "Star Trek" and "Event Horizon," but they're not just the stuff of science fiction. Now, there's new evidence that these gravity-powered matter-eaters have been around in abundance since the dawn of the universe, and might be responsible for how the cosmos looks today. Scientists say at least 30 million black holes had formed before the universe was 1 billion years old, which is quite early in the universe's 13.7 billion-year history. A new study published in the journal Nature explains this discovery, which was made using NASA's Chandra X-Ray Observatory. A black hole is a dense region of space that has collapsed in on itself such that nothing can escape it, not even light. Yet some of the brightest objects in the universe are black holes that are devouring matter around them, since a lot of energy gets released in that process, said Kevin Schawinski, astronomer at Yale University and co-author of the research. Material in the vicinity gets drawn in, and settles into a disc, called an accretion disc, that's constantly spiraling toward the black hole. As matter gets compressed by the black hole, X-ray radiation is emitted. No one knows how the first black holes were formed after the Big Bang, the initial explosion that created our universe. There are many theories -- for instance, that the first stars were very large and exploded into black holes, or that gas collapsed into itself, but none of these ideas really fit, said Fulvio Melia, professor of physics and astronomy at the University of Arizona, who was not involved with the Chandra study. These early structures are "supermassive" -- perhaps millions of times the mass of our sun -- and most of the light around them doesn't make it out of their galaxies, Schawinski said. Only the highest-energy x-rays can get through, and that's the invisible radiation that allows researchers observe the black holes indirectly. The early black holes in the Nature study, located at the centers of some of the earliest known galaxies, have been hard to pinpoint in the past because they've been buried in gas and dust, Schawinski said. "We've solved the mystery of where the black holes have been," he said. Using the Chandra observatory, astronomers scoured more than 250 distant galaxies, which had been identified with the Hubble Space Telescope. It appears that between 30% and 100% of the distant galaxies have growing supermassive black holes, which is about 10,000 times more black holes than previously believed. They then calculated that there must have been at least 30 million black holes before the universe's 1 billionth birthday. These black holes are also growing more aggressively than astrophysicists previously thought. Such black holes are so far away that the radiation emitted is extremely faint. So astronomers took 200 images of every part of the sky with one of these early galaxies, and layered the images on top of each other. Only in this "stacked" image could these black holes be detected. It's unclear which came first: the galaxy or the black hole, Schawinski said. The Chandra observations indicate that proto-galaxies already had central black holes, but it seems that the black holes and their galaxies are growing together. We see that pattern in more modern star systems: The bigger the black hole, the larger the galaxy around it. The Milky Way has a black hole in its center, too, about 4 million times the mass of the sun. "All the black holes we see at the centers of galaxies today are in a way descended from those baby black holes we see at the dawn of the universe," he said. How that happens is still a mystery, but this discovery shows that this symbiotic relationship went back to the dawn of the universe, Schawinski said. It could also change the way we think about the history of our universe, Melia said. If the black holes did come first, they would have played a critical role in the formation of the overall structure of the universe, Melia said. A young galaxy, shown in this artist's impression, has dust and gas at its center hiding a black hole. "In some strange, indirect way, we may owe our existence to these black holes, because many of the galaxies may not have formed at all if it weren't for the black holes being there first," said Melia, who was not involved in the study. These observations of early black holes also shed light on how the universe became transparent. The very early universe was full of atomic hydrogen, a period called the "dark ages" because it was completely opaque, Schawinski said. Some mysterious event "re-ionized," or turned the hydrogen into charged particles called ions, such that light could travel freely. The Nature study suggests that a typical black hole could not have "lit up" the universe in this way. That's because ultraviolet light would have been trapped behind gas and dust; only the highest-energy X-rays could escape, and they do not have this ionizing property. 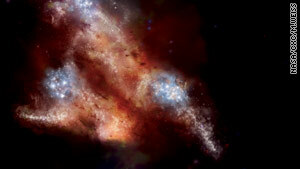 Schawinski's group plans to push even further into the early universe to gain more insights into the early black holes. But clues may also emerge at the Large Hadron Collider, the $10 billion particle smasher here on Earth at the European Organization for Nuclear Research (CERN). Insights from the LHC experiments might yield new properties of physics that could potentially explain the mysterious formation of the universe's earliest black holes, Melia said. Check out the Chandra mission website.